What I have attempted to do with this appropriated map is to generate a schizocartographic image that attempts to appear seamless with the original. A number of words and phrases have been added, in a similar style to the first, which may not be initially apparent. Most of the added text is from G. Spencer-Brown's text on the calculus of indications (boundary algebra) The Laws of Form (1969), for example: “the law of calling” and “unmarked states”. A highlighted box in the centre quotes a longer section from the book. Spencer-Brown's book, while about mathematics, is also philosophically influenced. He has been hugely important in the area of autopoiesis and second-order observation. This map is based on a map from the Chamberlin Powell and Bon University of Leeds Development Plan (1963). The underlying map shows the proposed gas, steam and water pipes for the campus in red, yellow and blue. 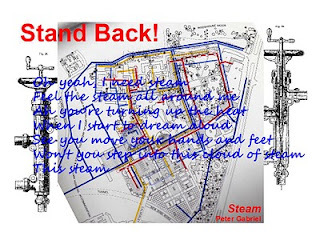 In order to produce an appropriated and subjective map (a schizocartography) of the original, I have superimposed some lyrics from Peter Gabriel's song Steam over the map and included some images of steam pipes downloaded from the internet. 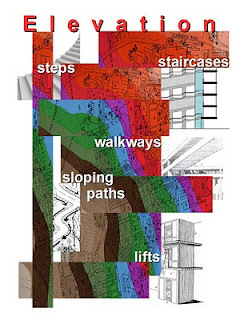 This image uses a map from the Chamberlin Powell and Bon Development Plan (1963) for the University of Leeds, which highlights the level of the ground on the university campus in different colours. The different elevations of land caused many architectural considerations when designing new buildings over such a vast area. I have added text and images to demonstrate some of the ways that these issues were dealt with. The discourses, practices and institutional structures of the Ideological State Apparatuses could secure nothing in themselves but only function as the reflex of an already inscribed power and repetitively re-enact or re-present what was already ordained at the level of the relations of production, into which a complex diversity of irreducible social relations were now collapsed. (ibid). In the chapter 'The Currency of the Photograph' Tagg, in his own words, “set[s] out to bring a semiotic analysis of photographic codes into conjunction with an Althusserian account of 'Ideological State apparatuses' and to hold them in place by a Foucauldian emphasis on the power effects of discursive practices.” (1988: 22). This has also been my attempt when discussing the actions and practices within the institution and the inscriptions of power on the body, prescribed through an ideology which promotes ideas of excellence. The institution can only re-present and re-inscribe power that is already available to it; but, I maintain, this is done through an ideological structure that promulgates certain ideas (ideologies) that become realised through concrete practices in the form of actions carried out by the body (the subject). Tagg states that cultural practices belong to “a field of power effects in which they are articulated with economic and political practices, representations and relations, without presupposing any unified outcome.” (1988: 30). He explains that it is “systems of representation” that actually operate on identities; constructing them, rather than expressing them (ibid.). The problem for anyone attempting to scrutinise the contemporary university's representation of itself, in regards to the effects it produces, cannot be critiqued outside of a historical analysis. As Tagg says: “There are no laws of equivalence, then, between the conditions and effects of signification, only specific sets of relations to be pursued.” (ibid.). Tagg's critique of how photography is used by the state hinges not around the “power of the camera” in its capacity as a technology used for surveillance but “the power of the apparatuses of the local state which deploy it and guarantee the authority of the images it constructs to stand as evidence or register as truth.” (1988: 64). In the age of virtual technology where the university's website becomes a portal to the educational institution, everything that is represented there, or indeed is accessed there, becomes, potentially, a guarantee of this authority. The university owns the copyright of the images of itself that appear on the homepage of the website, they cannot even be used by students in their own work. While my focus is not on photographic images, but rather cartography, many of the criticisms that Tagg directs at photographic representations of history also apply to representation in general, especially in relation to power. Tagg, in his discussion on Foucault, states that power “is what displays itself most and hides itself best” (1988: 67). This has become apparent in regards to the cemetery at the University of Leeds: it exists in actual geographical space, but is not very apparent in cartographic representations of the university campus1. 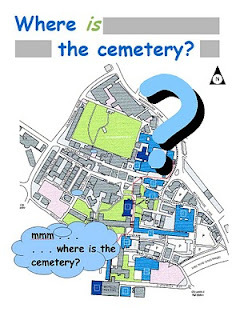 The map entitled Where is the cemetery? (above) demonstrates this problem: the cemetery, St Georges Field, exists and does not exist at the same time. I maintain that St Georges Field, in its (non) representation by the university, is highlighted perfectly when Tagg states in his criticism of Althusser: “What he does not show is that it is in the representational practices of these apparatuses themselves that the ideological level is constituted [...]” (1988: 69). What is not represented (and what is) is both a cause and effect of ideology. A regime of truth is that circular relation which truth has to the systems of power that produce and sustain it, and to the effects of power which it induces and which redirect it. Such a regime has been not only an effect, but a condition of the formation and development of capitalist societies; to contest it, however, it is not enough to gesture at some 'truth' somehow emancipated from every system of power. Truth itself is already power, bound to the political, economic and institutional regime which produces it. (1988: 94). Therefore, the ideology manifest in the concrete practices of the university utilise power in order to produce truth. But while these 'truths' appear in representations of the university, it is important that one does not get caught up in these representations and forget what appears behind them and holds them in place. We need to study the material of the university in order to be able to question its origins and reveal these regimes of truth. While meaning is made within the specific formation of the particular institution, this does not mean that the dominant mode of power cannot be challenged. This is acknowledged by Bill Readings when he explains that the Renaissance city streets offer the inhabitant a chance to reappropriate its “angularities and winding passages” (1999: 129); so too Tagg explains that institutions offer “multiple points of entry and spaces for contestation” (1988: 30). 1 At a presentation of my thesis to a group of academics at the University of Leeds, one said to me that he had been at the university ten years before he knew of the cemetery's existence. Tagg, John. 1988. The Burden of Representation (Basingstoke and New York: Palgrave Macmillan). In Discipline and Punish (1975) Michel Foucault discusses how mechanisms and processes within institutions become normalised as part of an exercise of power. Foucault explains that the classical age brought with it a different approach to education. The body was required to become “docile” through its management by “disciplinary power” (1991: 156). The operations required to be carried out by the student were controlled down to the finest detail and Foucault provides information on how this training was carried out: students were given strict instruction on how to sit and write (1991: 152). Foucault makes it clear that this form of direction was not about teaching or instructing the student in a specific gesture; it actually imposed “the best relation between a gesture and the overall position of the body, which is the condition of efficiency and speed.” (ibid.). Not only was it required that the individual (the body) was controlled to the minutest degree, but also that, with the required training, eventually these gestures would become 'natural' (1991: 156). It is essentially for the perpetuation of any ideology that the subject assumes their position (both within the apparatus and in his/her body): the student in the school makes the appropriate gesture which has not only become organic for them but also concretises them in the material process of the institution. They act as they are instructed: they carry out actions (Althusser) in the form of these gestures (Foucault) which are materially inculcated in the body-politic. For Foucault this body-politic is: “a set of material elements and techniques that serve as weapons, relays, communications routes and supports for the power and knowledge relations that invest human bodies and subjugate them by turning them into objects of knowledge.” (1991: 28). While it may initially seem that describing the contemporary student (or member of staff) as subjugated is a gross exaggeration of a state that the modern body could possibly be forced into in a democratic world; on closer examination it becomes apparent that power is applied in a much more subtle way in postmodernity. The seeds of the application of the power/knowledge process, that still operates in the institution today, are apparent in Foucault's exploration of education in Discipline and Punish. Before discussing how I believe Foucault's model of power dovetails with excellence in the posthistoric university, I shall briefly explain how, for Foucault, power works in relation to knowledge. Foucault explains that thinking of power and knowledge as separate from each other, that they exist in detached domains, is a mistake; in fact “power produces knowledge” (1991: 27). Foucault says “there is no power relation without the correlative constitution of a field of knowledge, nor any knowledge that does no presuppose and constitute at the same time power relations.” (ibid.). Knowledge of something – for example, a field of theory or, indeed, knowledge of individuals – produces power; but also being in a position of power enables knowledge to be gleaned. Foucault explains that this reciprocal power/knowledge process involves the knowing subject, the known object and also the modes used in the procurement of that knowledge (1991: 27-28). In relation to micro-politics, this works in regards to knowledge of the individual, in particular the body, as is apparent in instructing students on how to sit and write. It is this that Foucault describes as “political anatomy” (1991: 28). However, he makes it clear that this is a procedure that does not decontextualise the subject, or the body; it is the analysis of a process, the body-politic, which means the individual cannot be removed from this activity and examined on their own in relation to power (ibid.). The meticulousness of the regulations, the fussiness of the inspections, the supervision of the smallest fragment of life and the body will soon provide, in the context of the school [...] an economic or technical rationality for this mystical calculus of the infinitesimal and the infinite. (1991: 140). In the University of Excellence these are the qualifying gestures that measure the system's efficiency. However, describing them as simply 'gestures' implies that they are innocuous. By employing Althusser's ideological model we have seen how the individuals in the university become subjected through their actions. However, by applying Foucault's power/knowledge theory we can see how this process operates on the body itself. So, in a sense, this could be described as doubly material. If we hold that Althusser's subjection of the individual is material (actions take place within concrete apparatuses); and that, for Foucault, knowledge of the individual brings with it a process that propels them into a relationship of power through the control of the body (the material body as it functions within that particular domain of power), then excellence does not only invest the subject in the ideology of the specific ideological apparatus, it also physically represses them at the same time. While repression seems like an extremely strong term to use to describe what occurs within the university, when examining Foucault further it becomes apparent that this repression (subjugation) is actually quite subtle. Interestingly, Foucault also uses religion to examine power in relation to what is required of the disciplined individual, as does Althusser when he talks about how by carrying out the actions required by God you are showing that you believe (for example, kneeling to pray). Foucault says that details are essential to theology, God expresses his wishes through these details: “For the disciplined man, as for the true believer, no detail is unimportant, but not so much for the meaning that it conceals within itself as for the hold it provides for the power that wishes to seize it.” (ibid.). The detailed procedures that are part of the practice of religion - instilled in the actions carried out by the individual - provide access to power which becomes utilised elsewhere. In the university this works in a number of ways. One example to consider would be the feedback students are constantly required to 'volunteer' on the various service sectors in the university, for example: teaching, accommodation, catering or the library. It may not initially seem that power is being relinquished in these moments: a tick box form may not appear to have any other function than that of an attempt to improves services. Could a feedback process that asks for your individual experience of your BA be considered differently: a qualitative form, taking part in a meeting or an interview. All the information collected is saved and used within, and outside, the institution. This is knowledge about the student, detailed information that, in fact, most members of the university are constantly providing, without question. This information becomes the data on which the university operates: plans are formed form it, ranking takes place based on it. For Foucault ranking is part of the theme of classification which he situates in an epoch centred around the 18th and 19th centuries (the classical age). However, this ranking does not fix individuals, in the more obvious sense, in physical space; rather it propels them into this power/knowledge process (1991: 143). Foucault explains how disciplines of power work in relation to ranking: “Discipline is an art of rank, a technique for the transformation of arrangements. It individualizes bodies by a location that does not give them a fixed position, but distributes them and circulates them in a network of relations.” (1991: 146). The student at the university is constantly being assessed, and therefore ranked, through examinations, essays or feedback from lecturers or tutors: “The examination that places individuals in a field of surveillance also situates them in a network of writing; it engages them in a whole mass of documents that capture and fix them.” (1991: 189). The data produced from these assessments is considered in the light of excellence; ultimately appearing in ranking tables which enable the university to sell themselves in the national and international marketplace. But, simultaneously, the effect on the individual – this process of evaluation does not just apply to students, but also staff – is one that puts them into circulation in relation to power: “[...] the table has the function of treating multiplicity itself, distributing it and deriving from it as many effects as possible.” (Foucault 1991: 149). In a sense, the data produced and circulated becomes a form of currency: the university exchanges its ranking tables for new students (fees). In a Marxian sense the students and staff sell themselves (their bodies) to the university in the form of their labour – the student may appear to be the customer but they also bring in fees from elsewhere, by attending the university (and completing their course) they bring in funding. In becoming “the target for new mechanisms of power” (Foucault 1991: 155) the knowledge produced by the interrogation of the student/staff creates another level of product, one that is utilised when it is put back into play. When the data collected from individuals appears in the ranking tables, it provides an financial return. Foucault, Michel. 1991. Discipline and Punish: The Birth of the Prison, trans. by Alan Sheridan (London: Penguin Books). The term 'excellence', which Bill Readings describes as the “watchword of the University” (1999: 21), requires internal operations in order for it to be measured. These operations exist in the form of actions and practices carried out by individuals within the university: in particular, administrative staff, but also teaching staff and students. The assessments are considered to be quantifying procedures but are actually qualifying ones. The measuring systems used attempt to quantify something that cannot really be quantified (excellence is an empty and fluid term with no absolute measure). Really what is occurring is a qualifying gesture: the measuring of excellence is circular, it just enables excellence as a unit of measure to be reconfirmed. Thus, excellence is qualified (justified) in the measuring of itself. This is how the ideology of the university - this mirror-like process - enables actions to be sutured into its practices, at the same time reproducing itself as an Ideological State Apparatus (ISA), and its staff as subjects. Louis Althusser discuses this mirror relationship in relation to how the subject of ideology connects with the Subject of ideology through a process of misrecognition. Providing an example of Christian religion he explains that “God is the Subject par excellence” (2006: 121). It is essential for the Subject of ideology that He reproduces Himself in the form of His subjects; and since man has been made in the image of God he will see himself in Him (2006: 122). Althusser explains that it is this “universal recognition” that becomes the “absolute guarantee” that subjects within the relevant apparatus will do what is required of them by the institution (2006: 123). However, he does acknowledge that there are “bad subjects” (those who do not conform) who might require some form of repressive action (ibid.). Althusser uses the example highlighted by Blaise Pascal to demonstrate how actions inserted into practices actually work. And, here I am quoting Althusser quoting Pascal: “Pascal says more or less: 'Kneel down, move your lips in prayer, and you will believe. '” (2006: 114). For Pascal, to believe in God all that is required is that you pray. Althusser explains that, from the perspective of the single individual, this works through how the individual acts within the particular ISA: “[...] his ideas are his material actions inserted into material practices governed by rituals which are themselves defined by the material ideological apparatus from which derive the ideas of that subject.” (ibid.) (Althusser's italics). For individual staff who are part of the process of measuring excellence, this would involve such actions as: collating information on key performance indicators; processing student's feedback forms on their lecturer's; involvement in the peer review process; or developing knowledge transfer processes. But, the list is endless - mostly because these processes cannot be separated from the everyday operations of the university. One some level, everyone is working towards excellence. Nevertheless, in the educational institution I do think there are individuals who might behave as 'good subjects' - they may go-through-the-motions of carrying out the relevant actions - but may not 'believe'. Not all the staff of the university who participate in its practices are unaware of what is occurring on an ideological level. I do not believe that all the university's members believe in the term 'excellence' or accept that the 'corporate university' model is the right one for them or others to exist in: some do not, in a wholesale way, relinquish themselves to the corporatised university, they understand the term 'excellence', how it works, and its ideological origins. But, I do think that the institution requires a certain level of 'buy-in' to its ideology in order for it to operate in the way that it does. What is important to the university is that enough individuals are prepared to perpetuate the ideology of what Readings calls the “University of Excellence”. This is often done through the use of the word 'quality' - although, the term 'quality' is usually afforded to the university that operates as if it was a corporation, as opposed to the term 'excellence' which relates to the university as corporation (Readings 1999: 22). But Quality Assurance (QA) is still part of the process of measuring standards of excellence1. At the University of Leeds there is an Academic Quality and Standards Team that measures the excellence of the university's quality assurance procedures. So, even the processes that measure excellence are themselves measured. It is required that, in a kind of panoptic way, the university measures itself measuring. And, in relation to students, this works by seeing the student as a customer, and by so doing, creating a reciprocal relationship: the student also sees him/herself as customer and is, hence, supplied with a product-service - Althusser's “double mirror-connection” (2006: 122). Readings says “Students in the University of Excellence are not like customers, they are customers.” (ibid.). So, providing that students within the institution behave like customers – they 'act', in the Althusserian sense, by participating in customer-like practices – then the university has customers rather than students. Students pay tuition fees and therefore demand a return on their investment in a product: a degree. Many students now believe in the supplier/customer dialectic which is manifest in the form of the educational institution. The phrase 'I've paid course fees and therefore I should get a better [insert university service/product/function]' is not uncommon. This equates to value-for-money. Readings says that what this does is situate (or for Althusser: 'subject') the student as “consumer”, rather than as an autonomous individual who can make their own well thought-out choices (1999: 27). This ties in to how it is essential that the ISA is able to get the subjects to “work by themselves”, which is done by making the subject think they are making a free choice, but also by “submitting them to a higher authority” and hence simultaneously requiring they relinquish that freedom (Althusser 2006: 123). It is essential that this ideological process be seamless, opaque and 'instinctive' for its subjects: in other words, natural. Althusser says that the effect of this subjection is that it seems like a normal state of affairs, it is just the way things are (ibid. ): we all live “'naturally' in ideology” (2006: 116). We take up 'positions' that, by definition, are subjected ones, without realising we are doing so. According to Althusser we are “always already subjects” (2006: 117): we are hailed as such and we take up our place in the apparatus. Readings, too, discusses the 'natural'. He says that business management processes appear natural to those carrying them out, and he even uses the word “actions” when making this point (1999: 30). He explains that this works through the language used within management structures as part of administrative procedures; the processes adopted, and the language used to further their use, imply they are a natural path to take (ibid.). When discussing Total Quality Management Readings states: “[...] it is natural to adopt these means of planning, which are as old as humanity even though they were not formalized until the end of the 18th century.” (ibid.). While Readings is talking about procedures rather than individuals; it is the attitude of the subject adopting those procedures that naturalises their subjection due to their actions carried out in relation to them. A procedure is adopted, a material activity is carried out. Althusser, Louis. 2006. 'Ideology and Ideological State Apparatuses (Notes Towards an Investigation)', Lenin and Philosophy and Other Essays, trans. by Ben Brewster (Delhi: Aakar Books) pp. 85-126. Saturday November 21st 2009. I set off at 4.59am from the Parkinson Steps, on my own. Still dark, although a few birds were chirping, anticipating dawn which was still a while away. There were more people around than I had expected; mostly students coming back from their night out. My original plan was to walk the periphery of the campus (as shown on the map), to see how defined the edge of the campus is in real space, as compared to how it appeared on the map. I was also interested in how long it would take to walk around the university's circumference. My secondary project (Freud always thought it useful to have a secondary project) was to look for university signs giving prohibiting instructions. As it turned out, this didn't reveal anything particularly interesting, so instead I decided to look for buildings that appeared on the map to be university property, but actually turned out to not be. I did notice quite a few more of the monolithic university signs that are so commonplace within the campus boundary. While I do find them attractive, they do have a flavour of Kubrick's 2001, and are quite imposing. I guess we (the students) are the apes surrounding the stone (wisdom) and developing our tools (knowledge). I don't propose to continue the analogy, as it's too disturbing to contemplate. I found a large part of what appears on the map as the campus space dedicated to the NHS: The Mount. The NHS Choices website does acknowledge the existence of this site, located in Hyde Terrace, but provides no information on it, although one person seems to have 'rated' it. Further searching revealed it is for mental health teaching. At one point, while photographing a clamping sign, I heard a man coming up behind me - I'd previously seen him pulling into a car park nearby. He asked me if he could help me, which translated basically means 'what do you think you are doing?' I told him I was a student doing research. He told me not to photograph the place next door, which he called 'Covance'. I actually hadn't noticed it, so then became interested in it. The sign said 'Covance. The Development Services Company.' which sounds very innocuous and actually turns out to be a clinical pharmaceutical company which carries out trials here, on students (people desperate for money) – particularly in anti-obesity and dental pain (possibly considered to be a target group due to their perceived as stereotypical lifestyles). The sign is clearly hiding that it is drug-related as it only says ' Development Services Company', where the website says 'Drug Development Services Company'. Interesting. While walking towards Clarendon Road I saw a small sign attached to the wall saying 'isg' and an arrow. If you type in: isg leeds university into google, the first return appears with this headline: “ISG Wins £4m Leeds University refurb contract”. It turns out the ISG (Interior Services Group) are completing the final stages of refurbishment on the Michael Sadler building (according to the front page of Construction News), so perhaps the sign points towards the site office. Another link says that ISG are also doing the landscaping for the new childcare centre. So that's another £2.5m for them! In total I saw four foxes on my walk: two crossing Woodhouse Lane and two near St Georges Field. Other nocturnal beings were a man working for Metro, the bus company, whose job was to clean all the bus stops. I went to the Metro website to see how much he might be paid, but the only vacancy was for a Bus Station Manager £23,489 - £28,579 per annum. I was also asked if I had a light by a young man who crossed the road to ask me. I said I was sorry but I hadn't and then he swore quite angrily, I was worried for a few yards that he might be behind me (originally he had been walking in the opposite direction), but it turns out he wasn't. It was a short dérive and I was back at the steps by 5.37am. I headed into town to get breakfast at probably the only establishment open at that time. I noticed that the Rusty Building has a red light on top. I have decided to rename the building the Ginger Building in order to support the minority group. After eating I walked back to Headingley. I suddenly realised that since I'd left home a mist had descended. Note: The dérive has been named the Forgotten Solo Dérive as I forgot to pick up the customary souvenir. In 'Ideology and Ideological State Apparatuses (Notes Towards an Investigation)' (1969) Louis Althusser explains how he has developed his term 'ideology' from that of Karl Marx. He explains, that for Marx, ideology was a set of “ideas and representations which dominate the mind of a man or a social group.” (2006: 107). Althusser then goes on to distinguish the differences between a theory of ideologies and a theory of ideology: a theory of ideologies is grounded in history due to the class positions represented in the social formations taking place around it; whereas a theory of ideology is not oriented in history, because there is no position outside of ideology that can enable history to reflect ideology's position (ibid.). […] I think it is possible to hold that ideologies have a history of their own (although it is determined in the last instance by the class struggle); and on the other, I think it is possible to hold that ideology in general has no history, not in a negative sense (its history is external to it), but in an absolutely positive sense. (ibid.). This would be a 'positive' thesis for Althusser because he believes that there is a structure in which ideology rests that transcends history: the form that ideology takes, and how it operates, has been the same throughout time (2006: 108-109). Before discussing how Althusser's model of ideology fits into my discussion of the educational institution, and in particular the university campus, I would like to introduce Althusser's two theses that make up his essay. The first, which shows a radical displacement of Marx's original model; and the second which materially situates ideology. “Thesis I: Ideology represents the imaginary relationship of individuals to their real conditions of existence.” (Althusser 2006: 109). Whereas for Marx ideology is an illusion because it it misrepresents 'reality' to the proletariat, for Althusser it is the actual relationship between the individual and 'reality' that is misrepresented. Althusser concedes that this first thesis is a negative one in its representation of the object which is distorted (ibid.). He also believes that if ideology takes the form that he proposes, then this dispenses both with the idea that the authors of ideologies are powerful groups of people who deliberately mislead the less powerful 'other'; also the concept of alienation that was so important to Marx also, therefore, becomes irrelevant (2006: 112). The individual in question behaves in such and such a way, adopts such and such a practical attitude, and, what is more, participates in certain regular practices which are those of the ideological apparatus on which 'depend' the ideas which he has in all consciousness freely chosen as a subject. Althusser sees the actions that are carried out in relation to, for example, belief, duty and justice, correspond to attitudes in the subject that mean that they render themselves to a particular worldview (ibid.). And, for Althusser, both the attitude of the individual, and the practices in which they are involved, are material (ibid. ); as he confirms, they are “actions inserted into practices.” (2006: 114). A particularly interesting point Althusser makes in relation to how these practices operate on ideology is how by actually participating in them belief is produced (ibid.). It does not matter whether you believe or not, because the actions you carry out presuppose a belief that exists within that apparatus. Hence, the effects of the practice retroactively produces its cause through subjecting the individual. Therefore, the individual as subject is both the cause and effect. These actions are the effects of the ideological apparatus of which the individual is subjected, but they are also what produce him as the subject, as the cause of the effects. This is an integral part of Althusser's theory on structural causality. Why this is important for the institution (useful in terms of the promulgation of its ideology), is that those engaging in it, perhaps even at first sceptically, will eventually become subjected to it. This, I believe, is how the administration of the educational institution works, specifically in relation to 'excellence'. In The University in Ruins Readings states that we need to accept that the posthistoric university is a “ruined institution”, but: “Those ruins must not be the object of a romantic nostalgia for a lost wholeness, but the site of an attempt to transvalue the fact that the University no longer inhabits a continuous history of progressive revelation of a unifying idea.” (1999: 129). He goes on to explain that part of the understanding of this involves becoming aware of the complex spaces of the university in which we attempt to reside, but are actually unable to because we are alienated from them (ibid.). In the chapter 'Dwelling in the Ruins' Readings provides a concrete example of these ruins: “The campus of the State University of New York (SUNY) at Buffalo is decorated by some artificial concrete ruins that allude to Greco-Roman temple architecture [...]” (1999: 169). Readings sees the simulated ruins at Buffalo, situated next to modern buildings, as being problematic because they ground the arts and sciences in a specific tradition that amongst other things, excludes the local other: “ruins are the objects of subjective appropriation and mastery, whether epistemological or aesthetic.” (1999: 170). 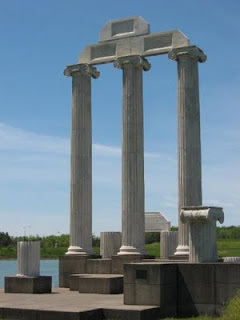 According to the website that the above image was downloaded from, the columns have been situated on the edge of a man-made lake and are “a popular hangout for students”. How the School of Management describes the ruins is particularly interesting, fitting in with the posthistoric critique of Readings, just discussed: “The Baird Point Columns represent education as a foundation of life.” If the columns are seen in this context, then they could be considered nostalgic, a hankering back to the cultural aspect attached to the nation-state, even if that cultural concept is not one of the origins of that nation, and rather is an adopted one (Greco-Roman). According to the Buffalo archives, the columns rise over 35 feet in height above the base. It also says “Today Baird Point is still used as a place for 'educational, cultural, and social activities'”. (University of Buffalo Libraries 2009). The University of Buffalo archives dedicates a whole section to the Baird Point Columns and their resurrection (figure 2). 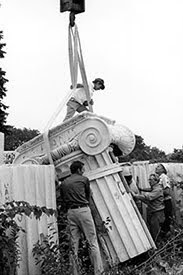 It explains how the columns were saved during the Federal Reserve Bank's destruction in 1959; they were cleaned but not reused until 1978 where they were placed at their current position. I do not think Readings is entirely accurate in describing the Baird Point Columns as “artificial concrete ruins”, as I believe this implies they have been created for the purpose of a representation that is one of obfuscation: the ruins are still the ruins of the bank even if they are not original Greek or Roman ruins. The university is not 'pretending' the ruins are from classical antiquity. The history of the columns is available for everyone to search out, even if that history is not at first apparent. What I think is particularly interesting, is that they came from a bank: the symbol of the university has been adopted from a financial institution. In 'Situationist Space' Thomas F. McDonough explains that “spectacle-culture” takes something away from public space that was once available to the individual; a city that once provided meaning and significance, now in ruins simply has the function of reproducing power: “its history is put back into play in harmless form as entertainment in, for example, tourist attractions where 'public' space is commodified [...]” (1994: 76). To inhabit the ruins of the University must be to practice an institutional pragmatism that recognizes this threat, rather than to seek to redeem epistemological uncertainty by recourse to plenitude of aesthetic sensation (nostalgia) of epistemological mastery (knowledge as progress). (1999: 170-171). Neither a Romantic aesthetic, nor a harking back to the humanist quest for knowledge as liberation, will enable a valuable critique of the posthistoric university. McDonough explains that the dérive as a practice helps to reappropriate “public space from the realm of the myth, restoring it to its fullness, its richness, and its history.” (1994: 77). Walking in urban space, examining its décor and investigating its signs, enable that history to be revealed. McDonough goes on to say that: “The Situationists' antipathy toward the 'charms of the ruins' was precisely an acknowledgement that these “norms of abstract space” that construct the public domain as evacuated were not “charming at all'”. (ibid.). While the Baird Point Columns may appear 'beautiful' or 'magnificent' to people, and be aspirational for the students at Buffalo, something is still being hidden from them in the process of their resituation. 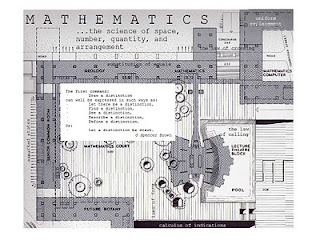 McDonough, Thomas F. 'Situationist Space', October, 67, Winter (1994), 58-77. Labels: SUNY "baird point" "baird point columns" "bill reading" "the university in ruins"
It is impossible to separate the production of any consumer commodity from the institution that supports that production. The same can be said of teaching, training, research, etc. The State machine and the machine of repression produce anti-production, that is to say signifiers that exist to block and prevent the emergence of any subjective process [...]. (1984: 34). In regards to the university, the “consumer commodity” would be considered the knowledge that is being 'sold' to the student and which is produced at the end of a course in the form of awarding a degree which can be exchanged for a job, ideally one of capitalist-orientation. It is even the case that the student could be conceived of as the commodity, rather than the knowledge gained which appears in the form of the degree. Guattari is saying that any process that is antithetical to that of the capitalist project will be prevented from emerging (as much as is possible). The signs that capitalism creates, discourage any singular processes of individuation and attempt to reroute subjective desires back into capitalist production: this is anti-production. Although I am reluctant to use dialectical terms like outside/inside when discussing post-structuralist themes, it appears from this definition that anti-production is a process instigated outside the individual, by capitalism. In the work that Deleuze and Guattari carried out together, anti-production represents a moment in production that occurs as a result of primal repression. For them anti-production appears to be autonomous but is not: it operates alongside production but is liable to being rerouted into the dominant productive processes and becoming recoded into the forms of representation used by that system. This definition, takes the form of an internal process that can become hi-jacked by capitalism. The walked paths taken by human beings through space is controlled by many urban features. There are the more obvious solid objects like walls and fences that prevent people from taking certain routes through space, but not all of these barriers are solid: they might simply exist in the form of a notice stating 'No Entry'. But, often space is controlled in a much more subtle way. For example, the idea of 'walkways' which were popularised by architects in the 1960s, especially in regards to university space. Walkways were meant to join areas of the campus together and also encourage students to 'bump into each other'. Even though this seems like an community-spirited idea, it has the function of controlling space in such a way that students are discouraged from taking other routes. Merlin Coverley explains that it is only by challenging assumed routes and investigating the unnoticed and dismissed areas, that one can get any real sense of what exists behind the surface of what appears as the everyday (2006 : 12-13). The students, academics and staff of the university move across the campus surface on established well-worn paths. Individuals tend to follow the same routes, as much for expedience as anything else. It is extremely unlikely that an undergraduate student attending a three year course would cover the paths that appear on the university pedestrian route map in the time they are at the university, let alone any routes that do not appear. As individuals in a busy postmodern world, we need to have an actual reason to go somewhere in order to see to see a new space; we are unlikely to wander, just for the sake of it. There could be many reasons for this, the discussion of which could make for a project in its own right. However, 'cheap' cars and a culture that does not encourage walking, do not help. Previous generations in Britain (and other cultures) walked most of the time. For example, in the 1960s it was considered perfectly acceptable to allow your children to walk to school, even when quite young. Multiple transport options allow people to move from place to place easily, but this also discourages the process of seeing the movement between places as an event in itself, an exploration of space. 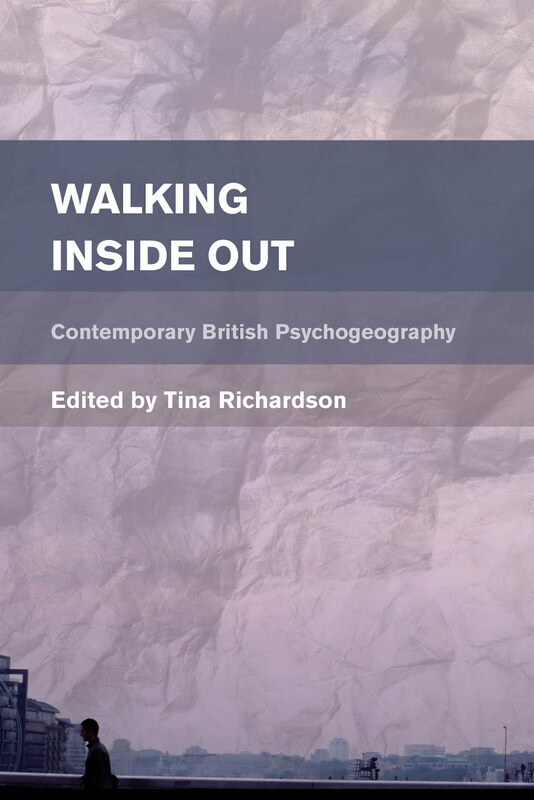 Walking enables the minutiae of the environment to be examined. Guy Debord explains how the city discourages detours because of its make-up: “cities have a psychogeographical relief, with constant currents, fixed points and vortexes which strongly discourage entry into or exit from certain zones.” (1996: 22). A large part of the practise behind this project has involved providing other paths around the University of Leeds campus in an effort to: challenge the established route; experience the campus in a different way; and as an attempt to probe the very fabric of the university in order to encourage it to reveal its history. This has taken the form of a number of dérives (see other blogs). Debord states: “The city is the locus of history because it is conscious of the past and also concentrates the social power that makes the historical undertaking possible.” (2005: 176). This can also be applied to the university. The past of the university exists in the very fabric of the campus, and it tells a story of power; not just in the form of administrative decisions such as those highlighted when discussing the Compulsory Purchase Orders, but also the less obvious ones about how an individual moves around the campus. This history does not only exist in historical documents; the actual campus itself can also be read in an attempt to investigate the past, and even the future. Debord, Guy. 1996. 'Theory of the Dérive', Theory of the Dérive and Other Situationist Writings on the City, ed. by Libero Andreotti and Xavier Costa (Barcelona: Museu d'Art Contemporani de Barcelona). pp. 22-27. Below is the map of the route, including a superimposed map which was used to create the zigzag path made by the method mentioned in the previous blog. One of our stopping places was Leeds General Infirmary. We moved through the hospital, as if tourists. At one point a security guard came and asked us if we were looking for the exit. Whether he had overheard us, or was concerned about our photograph-taking, was not apparent. In the above image, the small triangular area on the opposite side of the road was unkempt. There was graffiti, much rubbish, cracked paving stones, broken pieces of metal sticking out of the ground. It is not clear if the property is that of the university, or the council. People seemed to use it to park their cars, in the spaces between the trees. Much building work is being carried out on campus at the moment, the biggest project since the Chamberlin, Powell and Bon project of the 1960s. The contractors have signed up to the The Considerate Constructors Scheme, which is a code of conduct. On one of the hoardings around the new swimming pool area this tagline is displayed: “Improving the Image of Construction”. Unfortunately, this marketing move implies that it is just the 'image' of construction that needs to be improved rather than the 'reality' (although they could be considered to be one and the same, especially from the perspective of 'the spectacle'). The ticket said “Lea Farm Drive, Seacroft” on it, hence the name of the dérive. Having finished our walk we then entered the Victoria pub from the back entrance, which is a concrete ramp next to a car park in a modern building. You pass the trade bins to enter, in the semi-dark, a door and, going back in time, you emerge into Victoriana. It was rather like going through the back of the wardrobe to Narnia. This map was based on walks around the university campus at the University of Leeds. The arrows are random and placed in terms of the aesthetics of the map. A key was created in order to attach song titles to the ambiances of the quarters. The cross indicates a building that is no longer there. It is in the process of being replaced with two larger ones: halls of residence. Bill Readings describes 'excellence' as an empty, circular term that cannot be applied across fields; as he explains in a whole chapter dedicated to this phenomenon: “An excellent boat is not excellent by the same criteria as an excellent plane.” (1999: 24). Readings text is influenced by, amongst others, Jean-François Lyotard's The Postmodern Condition: A Report on Knowledge (1979) and this is apparent when Readings discusses the more 'performative' aspects of excellence's measure: “[...] the question of the University is only the question of relative value-for-money, the question posed to a student who is situated entirely as a consumer [..]” (Readings 1999: 27). He also makes reference to how this consumer-orientation of the university ties in with technology, which is also a large focus of Lyotard's critique. Readings says: “All that the system requires is for activity to take place, and the empty notion of excellence refers to nothing other than the optimal input/output ration in matters of information.” (1999: 39). I would now like to turn to an example, provided by Readings, of how choices based on these performance measures actually impact urban space; I shall also examine the same phenomenon at the University of Leeds: car parking. Readings provides a anecdotal example of how space is utilised at the University in relation to excellence. Jonathan Culler informed Readings that the University at which he worked, Cornell in New York State, had received an award for “excellence in parking” (Readings 1999: 24). While one might assume that this meant the Car Parking Services Department was efficient at getting cars in and out of the car park, and/or effectively utilising the space, so as to get as many in as possible, what it actually meant was - and I shall use Readings own words and italics here, so as to allow the irony to appear - “that they had achieved a remarkable level of efficiency in restricting motor vehicle access.” (ibid). Readings explains how the term 'excellence' has a function that enables it to work on either side of what can be considered as excellence: it becomes translatable and usable by anyone who wishes to describe excellence within any phenomenon, in whatever way they choose, by any criteria (ibid). No effort has been spared in Leeds on the part of the City Authorities, the Hospital Board and the Council of the University to make the planned expansion possible despite the extreme difficulties inherent in the comprehensive re-planning and redevelopment of the old City sites which have hitherto rested in many ownerships and were laid out between a network of streets obsolete for any present purposes. (Chamberlin, Powell and Bon 1963: 269). It is only when viewing the above-mentioned drawing, that it becomes apparent what the architects mean by “a network of streets obsolete for any present purposes”. The precinct in particular, but also many other areas of the proposed site, are terraced housing. This is made even more clear when looking at an aerial photo of a section of the University of Leeds campus, taken in 1953. Whole streets of terraced houses needed to be 'acquired' in order to become University property, and then be demolished so that the development plan could be put in place. This was done with the aid of Compulsory Purchase Orders (CPOs). Chamberlin, Powell and Bon. 1963. University of Leeds Development Plan (Leeds: The University of Leeds). Labels: "bill readings", "Chamberlin, "compulsory purchase orders", "university architecture", architecture, excellence, lyotard, Powell and Bon"
Take a downloaded piece of Situationist text ('The Theory of the Dérive' by Guy Debord). Using a piece of tracing paper, draw a dot over the first word on each line that begins with a 'p' (for 'psychogeography'). Make a separate note of all these words. Lay the tracing paper over a map of the University of Leeds campus. Draw a line, moving from right to left which connects those dots that lay on top of the map. Ignore the dots that are outside of the map. The end result is a zigzag line on the tracing paper that is superimposed over the map. The line becomes the route (as much as possible that it can be followed), the dots become the stopping places. Each point of stopping would then have the relevant word attached to it. Also, the photographs attached to the map, would be a picture looking towards the next point that would be visited. As before, we had a GPS tracking device, and two cameras, one attached to the stopping points on the map, as can be seen below. We began our dérive from the North edge of the university and worked towards the South, in a zigzag fashion. 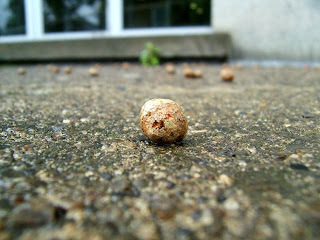 Within a few minutes of beginning, a 'found object' was stumbled upon, hence the name of the dérive (see image above). This campus dérive seemed to take us to a number of maintenance-related sites on the campus, including a section of the university that had asbestos located in a room behind the geography/textiles blocks area. There was a warning on the door, but the door had been left open, and the area was not protected. A number of redundant signs were found during the walk. Smallish, unobtrusive, plastic signs in varying primary colours, with arrows on. These were on a number of buildings in the area around the Union building. No text appeared alongside the arrows. Again we ended up in St. George's Field, but our route this time was different and we discovered a whole new set of phenomenonon in the cemetery. Including small memorial spots (maybe actual graves): one for a 6 month old child, going back to 1946. We discovered a blue plaque dedicated to Sir Clifford Allbutt, who apparently invented the clinical thermometer, which replaced the previous one-foot long one that the poor ill patients had to not only negotiate into their mouths but also hold in place while it took 20 minutes for the result to appear! The weather was poor. We were rained on more than once. Our dérive ended at approximately 4.00pm, but in that time we had at least 2 generous breaks. At some point during the dérive we realised we had been using the words attributed to each point in reverse order. We interpreted this as part of the chance element of the walk. We did not complete the whole of the original path assigned to the map by the above-mentioned method. However, it will be completed shortly, and will, of course, appear as a separate dérive because: a dérive is "considered as the time between two periods of sleep" (Guy Debord). N.B. This is the blog of one member of the group, and therefore is subjective.